16x20 Inches Ships in a sturdy tube Easy to Frame-standard framing size-thick paper. 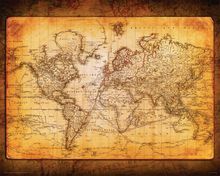 Great Wall Decor This Print is a vintage style world map. Easy to Frame-standard framing size-thick paper. This Print is a vintage style world map.